The Ottoman Empire (green) ceded some land (red-green stripe) to the Russian Empire (red) on both the European and Asiatic fronts. In addition, the Crimean Khanate (yellow-green stripe) was granted independence, although in reality it became a Russian satellite state and was annexed by Russia in 1783. The Treaty of Küçük Kaynarca Turkish: Küçük Kaynarca Antlaşması (also spelled Kuchuk Kainarjæ) was a peace treaty signed on 21 July 1774, in Küçük Kaynarca (today Kaynardzha, Bulgaria) between the Russian Empire and the Ottoman Empire. Following the recent Ottoman defeat at the Battle of Kozludzha, the document ended the Russo-Turkish War of 1768–74 and marked a defeat of the Ottomans in their struggle against Russia. The Russians were represented by Field-Marshal Rumyantsev while the Ottoman side was represented by Musul Zade Mehmed Pasha. Russia returned Wallachia and Moldavia to the Ottoman Empire, but was given the right to protect Christians in the Ottoman Empire and to intervene in Wallachia and Moldavia in case of Ottoman misrule. Bukovina was ceded to Austria in 1775. The Crimea was declared independent, but the sultan remained the religious leader of the Tatars as the Muslim caliph. This was the first time the powers of the Ottoman caliph were exercised outside of Ottoman borders and ratified by a European power. Russia gained Kabardia in the Caucasus, unlimited sovereignty over the port of Azov, the ports of Kerch and Enikale in the Kerch peninsula in the Crimea, and part of the Yedisan region between the Bug and Dnieper rivers at the mouth of the Dnieper. This latter territory included the port of Kherson. Russia thus gained two outlets to the Black Sea, which was no longer an Ottoman lake. Restrictions imposed by the 1739 Treaty of Niš over Russian access to the Sea of Azov and fortifying the area were removed. Russian merchant vessels were to be allowed passage of the Dardanelles. The treaty also granted Eastern Orthodox Christians the right to sail under the Russian flag and provided for the building of a Russian Orthodox Church in Constantinople (which was never built). The treaty was a most humiliating blow to the once-mighty Ottoman realm. It would also stand to foreshadow several future conflicts to arise between the Ottomans and Russia. This would be only one of many attempts by Russia to gain control of Ottoman territory. The Crimean Khanate, while nominally independent, was dependent on Russia and was formally annexed into the Russian Empire in 1783. Russia interpreted the treaty as giving them the right to protect Orthodox Christians in the Empire, notably using this prerogative in the Danubian Principalities (Moldavia and Wallachia) to intervene during the last Phanariote rules and after the Greek War of Independence. In 1787, faced with increased Russian hostility, Abdul Hamid I declared war on Russia again. The Ottoman-Russian War of 1768–74 had opened the era of European preoccupation with the Eastern Question: what would happen to the balance of power as the Ottoman Empire lost territory and collapsed? The Treaty of Küçük Kaynarca would provide some of the answer. After the Treaty of Karlowitz in 1699, the Ottoman Empire ceased to be an aggressive power; it had terrified Christendom for over three hundred years. From then on, it mainly fought against the overwhelming might of Christian Europe. The Habsburgs had been one of the Ottoman Empire's chief European foes, but by the middle of the century, the tsars had taken over the Habsburgs' fight against the Turks. The Russian tsars were seeking the Black Sea, the bulwark of the Ottoman capital of Istanbul. Finally, after two centuries of conflict, the Russian fleet had destroyed the Ottoman navy and the Russian army had inflicted heavy defeats on the Ottoman land forces. The ensuing Treaty of Küçük Kaynarca forced the Sublime Porte to recognize the Tatars of the Crimea as politically independent. Catherine the Great's annexation of the Crimea in 1783 increased Russia's power in the Black Sea area. The Crimea was the first Muslim territory to slip from the sultan's suzerainty. The Ottoman Empire's frontiers would gradually shrink for another two centuries, and Russia would proceed to push her frontier westwards to the Dniester. Texts of the treaty are also found in Italian and Russian. Grand Vizier Muhsinzade Mehmed Pasa signed Turkish and Italian copies of the treaty, while Field Marshal P.A. Rumyantsov signed Russian and Italian texts. Russian, Italian, and Turkish are the only three languages that original copies of the treaty were written in, and in case of a divergence between the Russian and Turkish texts, the Italian text would control. If the church was to be called "Russo-Greek" rather than just Greek, it would be more tenable for the Russian government to claim protection of the whole Greek church in the Ottoman Empire. 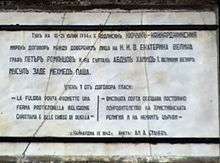 The Russian draft of the treaty presented to the Turks contained an article identical to article 14of the final treaty, which mentioned the right of Russia to construct a church of the 'Greco-Russian' faith. The English text erroneously states that the church is to be "of the Greek ritual." The construction of this church was, in fact, a violation of Islamic law because it called for the building of an entirely new church, not just the replacement of an old one. The Ottoman government had allowed Greek and Latin churches built before 1453 to survive, but no new ones could be built after the conquest of Constantinople. There is a history shown here, not of faulty copying, but of faulty translation of the treaty. 'Rusogrek' was mistakenly copied by a clerk as 'Rusograf.' Then, 'Rusograf' was incorrectly copied as 'Dosografa'(by Cevdet Pasa or the compiler of the collection of Ottoman treaties. It is unknown exactly who is responsible for the error). 1 2 3 Hoiberg, Dale H., ed. (2010). "Abdulhamid I". Encyclopædia Britannica. I: A-ak Bayes (15th ed.). Encyclopedia Britannica Inc. p. 22. ISBN 978-1-59339-837-8. 1 2 3 4 5 6 Davison, Roderic H. "The 'Dosografa' Church in the Treaty of Küçük Kaynarca." JSTOR. JSTOR, 24 Dec. 2009. Web. 23 Nov. 2013. <http://www.jstor.org/stable/614825>. ↑ Davison, Roderic H. "Russian Skill and Turkish Imbecility": The Treaty of Kuchuk Kainardji Reconsidered." JSTOR. JSTOR, n.d. Web. 23 Nov. 2013. http://www.jstor.org/stable/2495120>.